COOK COUNTY CRIMINAL COURTHOUSE — A Chicago Police officer has been charged with aggravated battery and official misconduct for allegedly beating a man with a baton in 2014. Kahn at the time filed a report saying he was “in fear of receiving a battery” when he pulled the baton because Smith had thrown a punch at Kahn. But Assistant State’s Attorney Theresa Smith during a bond hearing Thursday said cellphone-video evidence contradicts Kahn’s story — and that Jeremiah Smith never punched the man, attacked any officers or pulled a weapon during the 2014 arrest. Kahn, 31, now faces felony charges, more than two years after the attack. Prosecutors flagged his case as part of an ongoing investigation into police misconduct being conducted by the Independent Police Review Authority (IPRA), FBI and Cook County State’s Attorney’s Office, Theresa Smith said. Judge Laura Sullivan on Thursday said Kahn could be released on his own recognizance pending trial. Neither Kahn nor his defense attorney, William Fahy, spoke with press Thursday. But in court, Fahy described Kahn as a U.S. Army veteran who has served in Iraq and been a Chicago Police officer since 2012. Fahy said Kahn was anxious for his day in court, did not use excessive force during the 2014 incident, and was “trained and authorized” to use force as a Chicago Police officer when needed. Rahsaan Gordon, a civil attorney representing Jeremiah Smith, after court Thursday said he was “encouraged by the charges.” Gordon stressed that he while thinks being a police officer is “a tough job,” officers who go overboard need to be held accountable. 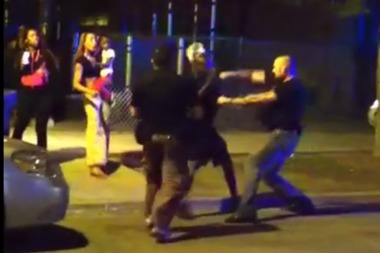 Video of the baton altercation was made public in June as part of a huge data release by IPRA. The oversight agency shared documents and videos from more than 100 possible police misconduct cases. Jeremiah Smith and Lisa Simmons, who was also arrested that night, sued the Chicago Police Department in 2015 — claiming they were brutalized at a party at 15th Street and Christiana Avenue in North Lawndale in July 2014. The pair was on the West Side celebrating a recording contract with a large group, ABC7 reported at the time. Kahn was working in a tactical unit — dressed in plain clothes but wearing a badge — when he tried to get that group to disperse about 10:40 p.m. in the 1500 block of South Christiana Avenue on July 11, 2014, Theresa Smith said. Several people were drinking alcohol in the middle of the block near a park, according to prosecutors. Kahn ultimately arrested Simmons, slamming her body into the hood of his police car, authorities said. In the video, Simmons tries in vain to move away from Kahn, who soon pulls out a baton and tells the crowd nearby to get out of the street or face jail time. Kahn can then be seen approaching Jeremiah Smith with a baton, prosecutors said, and punching him in the face with the baton in hand. Jeremiah Smith suffered bleeding and “excessive pain,” according to Theresa Smith. Jeremiah Smith was arrested for battery, resisting a peace officer and unlawful use of a weapon. He initially pleaded guilty to battery — a move his attorney said was designed to get him out of jail — but later had the plea vacated. The state’s attorney’s office dismissed the charges based on the cellphone-video evidence.